Middle East Gay Journal: Violence at World Pride? 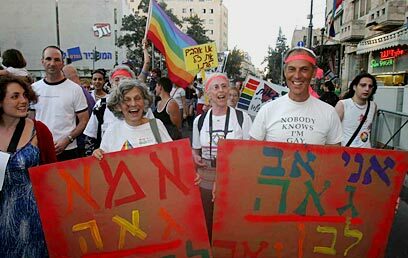 The media has abounded recently with articles about vehement opposition to World Pride 2006 in Jerusalem, scheduled for August 6-12. I previously wrote about gay Palestinian groups' advocating a boycott and an orthodox anti-gay march here. There's so much information, however, I have to write about it again. I am becoming increasingly worried that something very bad could happen at World Pride this year, for the words of those opposed to the march are rarely sophisticated, but are rather simplistic, hateful, and incendiary. Someone could easily take what they say to an extreme. “This attack is more venomous than the Zionist attack to make Jerusalem Jewish,” he said. That's a strong statement. Sarsur would rather Jerusalem be turned completely Jewish than let gay people have a celebration. “This is the root of the deep hatred Muslims have for Israel,” he said. “The Muslims are horrified by the public gay displays that emanate from the US. The last intifida is named after Jerusalem – 'al-Aqsa'. The feeling is that Jews disgrace Jerusalem's holiness with the government's encouragement. In their eyes the parade is part of a whole chapter where Israel brings the defilement of the United States and the West into the holy land and Jerusalem. And they react to it with bloodshed. "If left-wingers say that we have to make difficult compromises for peace," he added, "than the parade should be cancelled." So, according to Fromen, Muslims don't see the fight in Jerusalem as a battle between two religions, they see it as a battle between one religion, Islam, and an atheistic, defiling force, Judaism. I find that a bit hard to swallow. For, as much as Palestinians in Jerusalem may hate Judaism, I'm sure they see it as a religion, just a treacherous one whose followers are in gruesome, violent opposition to theirs. To think that they defile Jerusalem is one thing. To think that they institutionally defile Jerusalem on purpose is another. The whole idea smacks of anti-Muslim rhetoric, portraying them as ignorant savages, fighting fire with inferno. I also like how gay people, which aren't completely accepted in the United States, supposedly allow themselves to be used as pawns for the Western scheme. Or maybe they aren't gay at all, but just undercover Western agents pretending to be gay to corrupt the Muslims. Fromen never thought of that. "These are children who could be mine or yours, Ronit Tirosh told Israeli Radio. "The parliament must act as a model of tolerance. There are no legal or humane grounds with which to ban them," Tirosh said. Modernity requires the value of 'live and let live'. This is not yet the view of religious fundamentalists, irrespective of the religion. Social peace in today's world requires a high degree of tolerance or 'looking away' if you don't like what you see. Threats and hysteria from public officials, both Palestinian and Israeli, are useless and counter productive. The modern world is now here and not even Palestine or Israel will be able to hide from it. Palestinians gays should not stay away from Israeli gays. Both groups should mix together to show whether it is possible for the two people to live peacefully, eventually. When I lived in Jerusalem in the 1970s and 1980s the two groups had no problems mixing. It was from Palestinian gays that I got a broader understanding of the conflict than I had when I arrived. I was, in fact, thinking of Jamal only this morning. Nice thoughts, as usual.